Built on the sides of one of the valleys in Mellieha, Pergola Club Hotel & Spa hotel offers exquisite views of the church, the bay, the islands of Gozo and Comino, and the village. The picturesque village of Mellieha, with its many shops, bars and restaurants, is only 200 m from the hotel. You can easily access the main attractions before returning to the hotel where you can relax in the spa or enjoy a drink in the numerous bars. Pergola Club Hotel & Spa features a children's play area, a games room and an indoor and outdoor pool. At the Pergola you can choose between guest rooms and self-catering apartments, all with panoramic balconies. Free Wi-Fi access is available throughout. For lunch and dinner you have a vast choice of restaurants, all serving a delicious choice of Mediterranean dishes. End your day in style with live music in the trendy lounge bar. Stay in one of 479 guestrooms featuring flat-screen televisions. Conveniences include phones, as well as desks and irons/ironing boards. A supreme 4 star hotel with breathtaking panoramic views of the picturesque town of Mellieha. A sumptuous retreat for the business traveller, or a luxurious indulgence if you want to spoil yourself or a loved one.This property is 12 minutes walk from the beach. 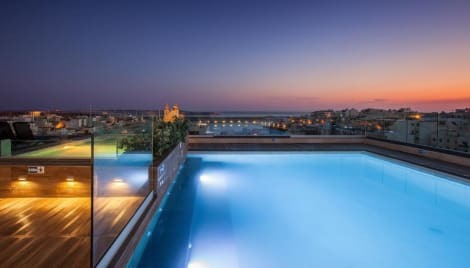 Offering a rooftop pool, a spa, and 3 restaurants, Maritim Antonine Hotel & Spa is set in the hillside village of Mellieha, 1 km from Malta's largest beach. It boasts panoramic sea and country views. It is just 25 km from Malta International Airport. The hotel includes 3 pools, one of which is a heated indoor pool, and a sauna. There is also a modern gym and numerous state-of-the-art treatments available. Wi-Fi throughout is free. All spacious, elegant and air conditioned, the rooms come with satellite TV and free coffee-making facilities. Some overlook the sea, garden, or city. Guests can enjoy fine dining and traditional Mediterranean dishes at the on-site restaurants. An English pub with wide-screen TV showing all major sports events is also available, as well as an elegant cocktail bar. A business centre with conference facilities can be booked. Situated in the north of the island, the property is a 30-minute drive from the capital Valletta. The Labranda Riviera Hotel & Spa is located in one of the best-preserved areas of northern Malta, offering a seafront location next to its free private beach.Malta’s hidden jewel, Hola Beach is a stone’s throw from the hotel. Hotel clients are entitled to free access to Hola Beach and free sunbeds. Its quiet location, comfortable rooms, 1000 m2 Thallasso Spa, two spacious outdoor and one heated indoor sea water swimming pools, bars and restaurants provide the best that Maltese hospitality, culture and environment have to offer.Guest rooms have a private balcony and bathroom, are comfortably furnished and offer a range of different views, open sea, country, pool or beach views .Facilities include heating [winter] air-conditioning [summer], (both heating and air-conditioning are centrally controlled) hair dryer, satellite TV, direct dial telephone, minibar and safe. Free WIFI is available through out the hotel . The Hotel also has a approved Diving School offering various diving packages to numerous dive wrecks and diving sites found in the vicinity. The LABRANDA Riviera Hotel & Spa offers guests the chance to book accommodation on Bed & Breakfast, Half Board or during Summer only Ultra All Inclusive basis. The LABRANDA Riviera Resort & Spa is ideal for exploring the islands with the Gozo ferry being only two bus stops away. Malta’s largest blue flag sandy beach and the town of Mellieha are also just a few bus stops away. A regular public bus service connects the resort to other towns including the capital Valletta and Sliema. The recently renovated Solana Hotel & Spa offer you the best of all worlds at one of Malta’s most premier luxury accommodations. As a guest you’ll be greeted to a blend of modern aesthetics, a variety of dining options, and amazing features like the rooftop pool. Solana’s prime location in northern Malta takes you far away from the urban noise and close to some of the most beautiful beaches in Malta.Some of Solana’s special features include an indoor pool as well as outdoor pool, sun terrace, spa, and fitness centre. With three restaurants and two bars to choose from, there’s something for every guest here. Solana’s rooftop pool offers impeccable views of the sea and Malta’s sister islands, while the outdoor lounge area offers shade under the umbrellas. The hotel has 165 rooms and are all of excellent standard. Each room is decorated in a modern-contemporary style and offers excellent facilities including an en-suite bathroom, twin/double beds, individually-controlled central heating and air-conditioning, satellite TV, tea and coffee making amenities, mini-bar (stocked on request), hairdryer, direct-dial telephone and a reliable Wi-Fi connection. 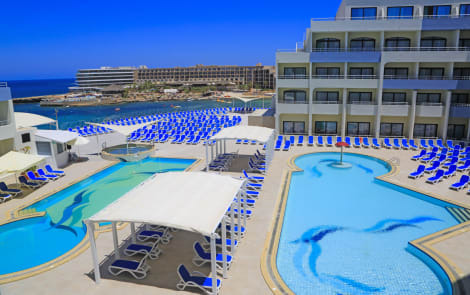 The contemporary, 5-star Radisson Blu Resort and Spa, Malta Golden Sands is set on a private beach, three miles from II-Majjistral Nature and History Park. You can take a dip in the swimming pool or lagoon pool, and relax in the spa with its gym, sauna and treatment rooms. There are four restaurants to choose from for dinner, and you can enjoy cocktails and ice cream at Peddles Bar. The stylish rooms provide free wifi, satellite TVs, and marble bathrooms with free toiletries. Strategically located 30 meters away from Malta’s largest beaches, and surrounded by an amazing array of options, staying at the db Seabank will guarantee you peace of mind and a refreshing experience. From the gastronomic delights to the entertainment, restaurants, shopping, spa & fitness centre, outdoor activities and body mind alternative courses you will always discover something new to do at the db Seabank Resort+Spa All Inclusive. lastminute.com has a fantastic range of hotels in Mellieha, with everything from cheap hotels to luxurious five star accommodation available. We like to live up to our last minute name so remember you can book any one of our excellent Mellieha hotels up until midnight and stay the same night.